300W, Brooder Lamp, 10" Reflector Shade, 6' 18/2 SJT Cord, Sturdy Clamp With Vinyl Coated Grips Included, Has Insulated Porcelain Sockets, Heavy Gauge Aluminum Reflectors and Bulb Guard That Snaps On The Reflector, 2 Conductor, Polarized Plug, Tray Pack. 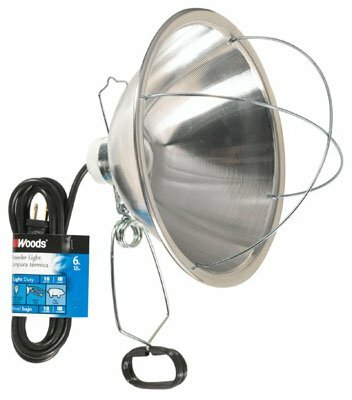 Woods 0166 18/2-Gauge SJTW Brooder Clamp Lamp with Bulb Guard and 10-Inch Reflector, 300-Watt, 6-Foot Cord. 10-inch adjustable reflector with bulb protector. Easily hangs with built-in integrated hook hanger or positions flat. Works great for warming pigs, chicks, small farm animals, garages, workshops, painters, and more. Accepts up to 300-watt bulb with porcelain socket. If you have immediate questions about application, installation, troubleshooting, or a damaged component, please call CCI Consumer product hotline at 1-800-561-4321 or email questions to: CCI.ConsumerSupport@southwire.com. The Woods (R) brand is a registered trademark of Coleman Cable Inc.